16-12-2006 9:00 am On 16 December 2006, Her Royal Highness the Princess of Hanover, UNESCO Goodwill Ambassador, and the Director-General of UNESCO awarded the 2006 UNESCO Prize for the Promotion of the Arts – New Technologies to Ms Ivani Santana from Brazil for her creation entitled “Man Has Made His Difference”. The award ceremony was organized on the occasion of the fourth Monaco Dance Forum from 9 to 16 December 2006 in Monaco where, as the Director-General said, “artistic and cultural modernity is rooted in the common soil of tradition and exchange.” For the nomination of the 2006 prizewinner, an international jury of UNESCO reviewed 20 works, pre-selected by the “Monaco Dance Forum”, under the presidency of Her Royal Highness the Princess of Hanover. 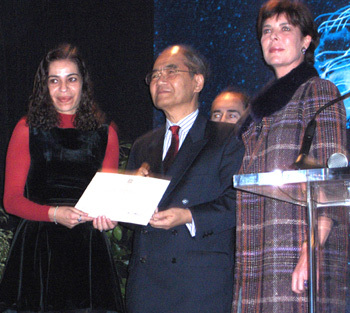 The UNESCO Prize for the Promotion of the Arts, founded by Mr Kaii Higashiyama, a well known master of Japanese traditional painting, is awarded to young artists or groups of artists in the fields of the visual arts, the performing arts and new technologies in recognition of outstanding creative achievements and to encourage their future artistic development. The New Technologies Prize is awarded annually in the framework of an international or regional cultural and artistic event. The total amount of the Award is US$ 10,000.